The horror spoof was the highlight of Saturday's episode. 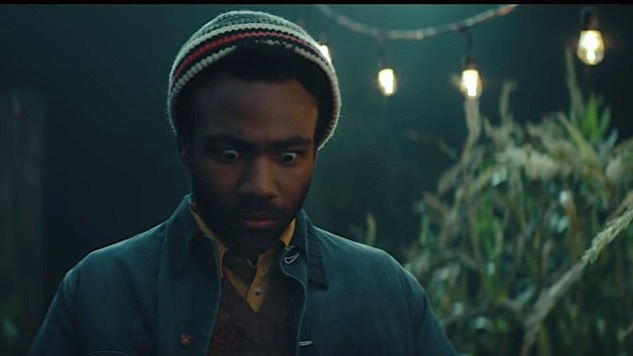 Donald Glover, as is his habit, did a little bit of everything when he hosted Saturday Night Live this weekend: He debuted two new songs as Childish Gambino (with intros from Daniel Kaluuya and Zoë Kravitz), shared a music video for one of them, and appeared as Lando Calrissian in a Solo: A Star Wars Story teaser. Topping them all was “A Kanye Place,” an ingenious skit, based on John Krasinski’s hit horror flick A Quiet Place, about a group of friends fleeing monsters in a corn field who just can’t manage to keep quiet about Kanye West’s latest Twitter catastrophe. In A Quiet Place, a family must live in near-total silence while hiding from alien creatures that hunt exclusively by sound. In SNL’s spoof, four friends (Beck Bennett, Aidy Bryant, Kenan Thompson and Glover) are picked off one by one as Glover’s character insists that they read West’s tweets about Donald Trump. The three-and-a-half-minute production was originally written as a live sketch, but writers Sudi Green and Fran Gillespie break down their initial idea for the sketch, why they opted to film it rather than shoot it live, and how they built a cornfield and put CGI monsters in it in just 36 hours. Check it out.